I believe in “love at first sight”. However, I didn’t fall for a man, I fell in love at first sight with a bottle of sake at LCBO. It happened at LCBO’s Markham store on 3075 Highway 7, just east of Woodbine Avenue, in the same plaza as Longo’s Supermarket. 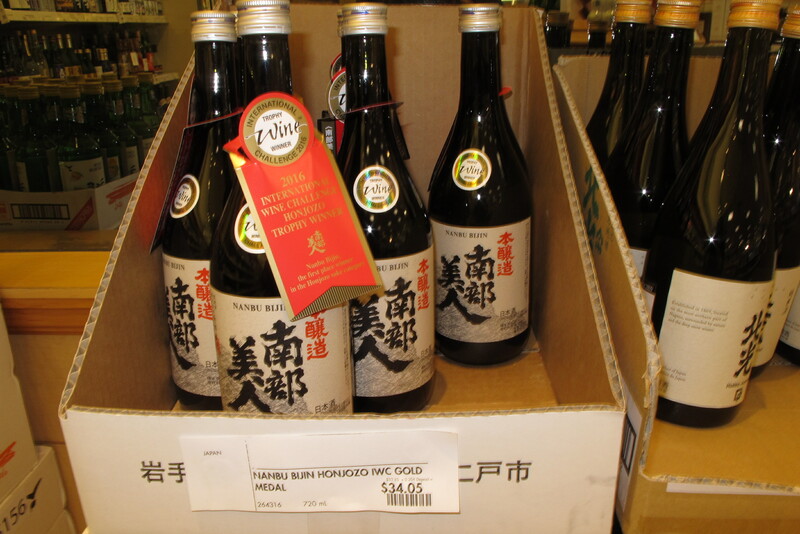 There are two LCBO retail stores in Ontario that offer a great sake selection. The Markham location is one of those, and the other one is in Richmond Hill. More than 150 kinds of sake are available in each of those two stores. Edward is the manager of the Asian spirits at LCBO’s Markham store. I first met him at Kampai Toronto Festival of Sake on June 1. He is fluent in Cantonese and has acquired a great deal of knowledge about sake; therefore, many local Chinese consumers like to speak with him to inquire about the latest releases at LCBO. As far as I know, Edward works shifts, and customers usually bump into him at store by chance. Last Tuesday I was lucky enough to meet Edward at the store. He was price-tagging the new arrivals. While he was minding his own business, I was attracted by some bottles having bright red tags on the necks. Those were the award winning Honjozo made by Nanbu Bijin Brewery. I fell in love with them at first sight (LOL)!! I inquired Edward about the Honjozo and he highly praised for its quality, as the sake won the Gold Medal of Honjozo Category in the 2016 International Wine Challenge. Price for a 720ml bottle was CAN$34. I believed it’s a value for money sake, so I gave it a try. Later, I realized that this particular Honjozo is introduced on Nanbu Bijin Brewery’s official website. As for its alcohol contain, the percentage is between 15 and 16, and the polishing ratio of the rice grain is 60%. Since the polishing ratio is lower than the limited 70%, I expect the sake having lighter cereal and lactic aromas than average Honjozo. The rice variety used for brewing this Honjozo is called ひとめぼれ (Hitomebore), which translates to “love at first sight” in English, such a romantic name. Hitomebore was created in Japan as a hybrid rice variety. Laboratory research and development was first done by scientists in 1981 in Miyagi Prefecture. Two different rice varieties, Koshihikari and Hatsuboshi, were used to cross breed to create a new variety, Hitomebore. Since the R&D was a success, Hitomebore has since been known for its good taste and cold resistance. In 1991, the name of Hitomebore was registered as a new rice variety in Japan. Water plays an important role in sake making. The water used was from the Oritsume-Basen Glen in Iwate Prefecture. This Honjozo was fermented in low temperature, and has acidity level of 1.3. The English label at the back of the bottle states that it has “a beautiful bouquet of pineapple and melon with a silky texture and an elegant finish”. The brewery also suggests to pair it with grilled meats, seafood and international cuisines. I am invited to a BBQ party this Thursday, and this Gold Medal awarded sake will be brought to the party to be shared among friends. I am curious to know how many of them will fall for it at first sight.